Humble Quilts: You Could Make a Barn Quilt!! You Could Make a Barn Quilt!! This is my last post of Ohio! Promise!! Here are more great barn quilts! This is the carpenter block on a Nazarene church property. A few of them opted to put theirs on a sign post. I think it looks great! The gallery of Ashtabula County barn quilts is HERE. You can get ideas of colors or blocks that you'd like.If you wanted to make one for your property. Directions for what kind of paint and how to do it can be found HERE. Click on standards. It is 4 pages long, don't let that scare you- it is a lot of details, but not as hard as you would think. My sister made this for her house in Idaho after seeing the barn quilts and using the directions I listed the link for! It looks really cute! Awesome barn quilts! I have never seen ones so detailed! Maybe I can make a small one from the directions, hmmm, maybe a few small ones. There is a Barn Quilt Tour in Washington that I wnat to take. Maybe along with my Row by Rowing this Month...lol Love the Barn Quilts you shared. They look good on the Sign Posts. I's a fun way to get sightseers! I think I ve seen the quilt blocks in PA, maybe. I thought from your header you were saying to make a real quilt with blocks you visited, which would be fun. Thanks for the Barn Quilt Tour. I checked for Barn Quilt trails in Texas, and only three counties were shown on the map, and two of those links say they cannot be reached. Rats! The link that works is quite a distance from me, but I just may have to check it out some day. ---"Love"
I enjoyed the tour. I doubt I would ever get a barn quilt made, but I enjoy seeing what others are able to create. I bought one at the Sunriver Quilt show a couple of years ago, although I don't have it hung yet--of course, I don't have a barn but would love to hang it on my garage. Don't think I am likely to make one myself, though!! They are great to look at! 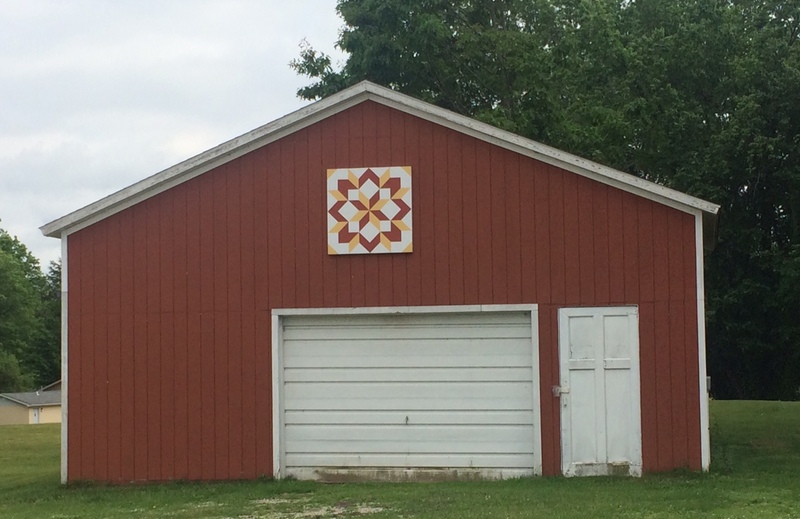 I love coming across barn quilts while traveling...just makes the country side friendlier! Or a person could make a sampler quilt using their choice of the blocks represented on the buildings. I have seen a few around here on the horse barns. Fun! I love your post about Ohio ! Don't apologize! I love the Ohio pictures! Hope to visit the pram museum some day. These photos are great! I have wanted to put a barn quilt on our shed for a while now. I'm going to check out the link. Thanks! I never get tired of seeing barn quilt pictures! I was so surprised when you mentioned a Nazarene church since I attend a Nazarene church in Idaho! What is a carpenter block? And why does a church have one? Thanks for sharing your great photos, I like the quilts on the sign post so bright & cheery!!! I so enjoyed your trip, NOW I have to make a Barn Quilt for my Studio!! thank you for the link, I've wanted to make a barn quilt, and now have the info. Appreciate the photos and love the ones that are nearly free standing with supports by fence posts. This area is just across the state border from me here in PA. Brants apple orchard was a stop on the 100 mile bike ride I did last August in Ohio. They gave us the best apple cider slushy.